Spring is here again and the temperature here in the Valley will soon hit hit 100 degrees, so it’s time to put away the electric blankets and space heaters, and change the direction on your ceiling fans. Our phone has started ringing, and it’s going to get a lot busier before it slows down. We want to take a moment to go over the reasons why a Spring a/c checkup might be in your best interests. 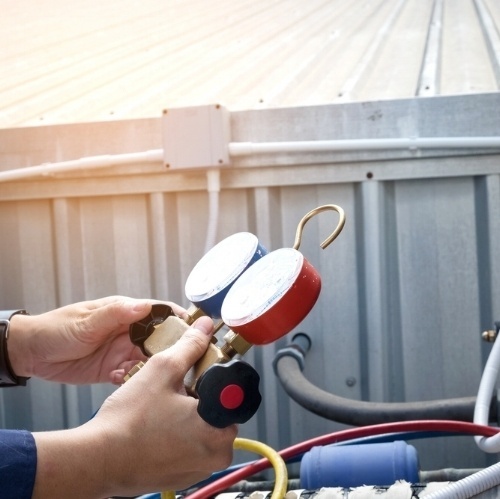 Your HVAC is a huge workhorse during the summer months, so a little attention now can prevent big problems later. I know most of you have heard this before, which is great. That means our customers are informed. This will just be a reminder. The Spring a/c checkup is a service we perform in which several things are checked and addressed. We try to do this before the really hot weather arrives. We check your refrigerant and charge it if needed, because, of course, these are the months that you’re really going to need it. If it’s leaking, we address that before you find out the hard way. We check the coils to see if they’re dirty, which can interfere with the entire cooling system. Dirty coils are the result of an improperly installed filter, a filter which is taken out and not replaced, and also, we live in some very dusty conditions. Those coils can get dirty and freeze up. A non working or poorly-working thermostat is irritating at the least. If the thermostat is broken, it can interfere with the cooling and you may call us thinking your HVAC is acting up. Checking the thermostat can avoid this and save you money. If the condensate pump needs to be cleaned or replaced, this is a good time to do it. Sometimes those pumps fail or become clogged during winter months, and if that’s the case, we’re happy to flush it out for you or replace it. Whether you have a disposable or reusable filter, now is the time to step up the regular maintenance of that filter, which means replacing it or cleaning it about every four weeks. A clean filter means your HVAC doesn’t have to work as hard, which will save money on your electric bi ll. In addition, we will replace any worn belts, tighten any loose electrical connections, and perform a few other tests and checks to make sure things are ready for the summer season. We want you to have a cool, problem-free summer. If you decide you want a Smart thermostat, we can install that for you, as well. Smart thermostats are a great way to control cooling costs with a temperature schedule custom tailored to your family’s needs. We recommend them, especially for busy people and people who are committed to getting that summer electric bill as low as possible. A Smart thermostat will eventually pay for itself.